Visual media drives inspiration. When seeking to get inspired about how to host the perfect holiday get-together, many women use social media and lifestyle sites to discover how to throw a fantastic holiday party or meal. As part of the POPSUGAR Insights 2017 Holiday Report, we asked 3,000 US women to tell us where they go to seek food and beverage inspiration for the food and beverages to serve at their holiday events. 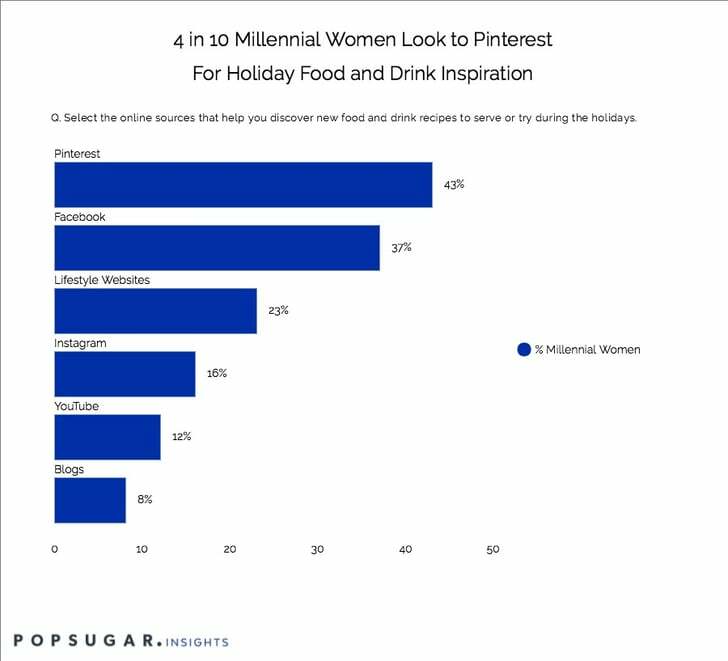 Pinterest (43%) is the top destination for holiday entertaining inspiration this holiday season, followed by Facebook (37%), Lifestyle websites (23%), and Instagram (16%). Blogs were cited as a source of inspiration by only 8% of millennial women. For younger millennials, Facebook and Pinterest (41%) were equally popular. Brands have an opportunity to connect with millennial female holiday hosts this holiday season by offering them "new ways to make traditional holiday recipes" (28%), "tips on how to host a stress-free party" (17%), "printable shopping lists" (17%), and "tips on how to make healthier holiday meals" (14%).